Teachers’ Identity in Nazarbayev Intellectual Schools in Kazakhstan. Story About Romania’s Never-Ending Educational Reform. Fears and Difficulties Experienced by Ukrainian Nationals During Their Period of Study in Poland. Holocaust Education in Lithuania: Community, Conflict, and the Making of Civil Society, Christine Beresniova, ed. Lanham, MD: Lexington Books, 2017. Paris. Editor and translator: Luis M. Naya Garmendia. The Effects on University Faculty. Organizational Socialization and Job Satisfaction of Faculty at Nazarbayev University in Kazakhstan. Faculty Challenges and Barriers for Research and Publication in Tajik Higher Education. Raising Research Productivity in a Post-Soviet Higher Education System:A Case From Central Asia. Career Aspirations of Young Academics in Russia. The Owl of Athena: History, Philosophy, and Humanism in Comparative Education. The Possibilities and Potential of Transnational History: A Response to Kazamias’ Call for Historical Research. 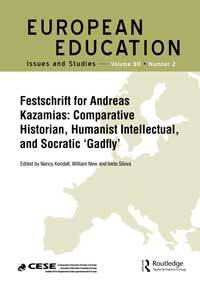 Andreas Kazamias: Socratic Gadfly of Comparative Education. Contra Aquam Remigare*: Reimagining Humanistic Paideia Through Comparative-Historical Analysis of Education. Stories Small and Tall: A Celebration of Andreas Kazamias’s Praxis. Reflections on “Paideia of the Soul”. The Humanist Important to Our Times. “Democratic and Humanistic/Humane Paideia in the Euro-Cypriot Polity—Prospects for Reconstruction and Modernization”: A Biographical Sociological Analysis of a Reform Initiative in a (De-)Globalizing World. Andreas Goes to Africa: A Comparative Historical Study of the Teachers for East Africa Programs. Histories of Romani Education in Slovakia: A Kazamian Perspective. Reflections on Comparative Education: Telling Tales in Honor of Andreas Kazamias. Reflections on Andreas Kazamias and Greek Myth. Proteus: Comparative Education and/in the Spirit of Andreas Kazamias. Searching for the Soul: Athena’s Owl in the Comparative Education Cosmos.